The appearance of the Zeiss ZX concept camera first announced at Photokina 2018 seems to have taken a step closer following hands-on demonstrations of a pre-production camera at CP+ 2019. The unit appeared to be a working prototype, but Zeiss has still not given any details about when it will be available and how much it will cost. Zeiss will need to get a move on, or it risks being upstaged and outgunned by the rumored new Leica Q2. The ZX1 does at least have its own website, where you can sign up to be notified as soon as this baffling but beautiful prestige compact camera becomes available. Zeiss has used its optical expertise to make the Distagon 35mm f/2 lens for this new camera. It’s also developed the ZX1’s 37.4 megapixel sensor in house, which is is quite a departure for a company best know for its lenses. Zeiss is calling the ZX1 a mirrorless camera, though its 35mm f/2 lens is non-removable, so you wouldn’t expect a mirror anyway. Its themes are ‘Shoot’, ‘Edit’, ‘Share’. On the shooting side, Zeiss is aiming for the “familiar, intuitive image editing and connectivity of a smartphone” and “a seamless creative process”. The lens and sensor look interesting, but it’s the editing phase inside the ZX1 that’s really caught our attention – Zeiss says it has Lightroom CC “fully integrated”, which we take to mean the Lightroom CC Mobile version, which in turn suggests the ZX1 might be running some version of the Android operating system. Camera (and Lightroom) control is carried out via a 4.3-inch multi-touch display considerably larger than those fitted to regular cameras and closer in size to a smartphone screen. 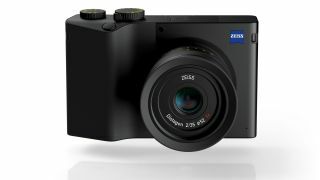 Zeiss says the ZX1 will be able to upload images directly to the Internet in the third ’sharing’ phase, without the need to use memory cards or external devices. You’re probably not going to need any memory cards at any point, in fact, because the ZX1 has 512GB memory built in. That’s more than the average laptop’s SSD. So far journalists have only been able to inspect a non-working mockup fixed to a table, but Zeiss is planning to introduce the ZX1 in early 2019 at a price yet to be disclosed.